This entry was posted by Jason Berggren on June 27, 2011 at 10:43 am, and is filed under Churchy Stuff, Funny Stuff, Jason In Real Life, Unauthorized Blogs. Follow any responses to this post through RSS 2.0. You can leave a response or trackback from your own site. It’s cute, he is a kid! No big deal. Don’t kids do stuff to embarrass their parents all the time? It’s true. 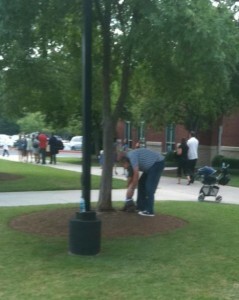 But peeing on the tree in front of church is not what most parents want to see their kid doing.